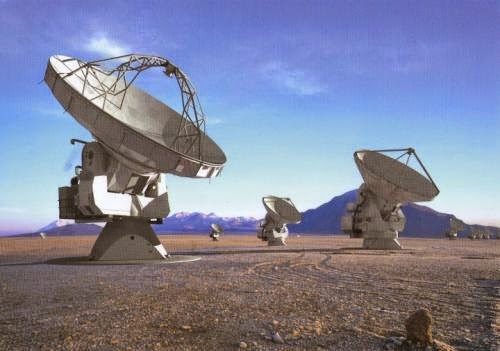 Postcard PL-952957 from Poland shows the Atacama Large Millimeter and submillimeter Array (ALMA), an astronomical interferometer of radio telescopes in the Atacama desert of northern Chile. The array was constructed on the Chajnantor plateau at 5,000 meters or 16,597 feet altitude, near Llano de Chajnantor Observatory and Atacama Pathfinder Experiment, to provide a high and dry environment which is crucial to millimeter wavelength operations. Initially consisting of 66 12-meter or 39-foot, and 7-meter or 23-foot diameter radio telescopes observing at millimeter and submillimeter wavelengths, ALMA is design to study star birth during the early universe and detailed imaging of local star and planet formation. With its groundbreaking ceremony at ALMA site in November, 2003, ALMA began scientific observations in the second half of 2011 resulted in the first images available to the public on October 3, 2011. Inauguration ceremony was held on March 13, 2013 with the array being fully operational since. Unrelated, it is the 3rd anniversary today since Professor Fang Lizhi (方励之), born February 12, 1936, passed away in Tucson on April 6, 2012 at age 76. A Chinese astrophysicist and activist whose liberal ideas inspired the pro-democracy student movement of 1986–87 and, eventually, the Tiananmen Square protests of 1989, Professor Fang was a recipient of the Robert F Kennedy Human Rights Award in 1989. During his tenure as Professor of Physics at the University of Arizona, he continued to carry out research in astrophysics and cosmology with special interests in the cosmic microwave background anisotropy, Lyman alpha forest, application of wavelet in cosmology, turbulence in intergalactic medium, and the 21cm radiation during the Reionization.